At Adat Shalom we do our utmost to create engaging Jewish learning and social experiences that meet the needs of kids and parents. It is our goal to plan fabulous social, cultural, and community service experiences that your child or grandchild wants to attend. 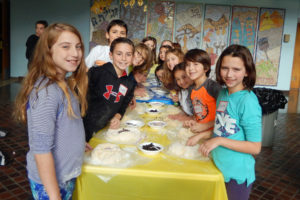 Their participation helps to strengthen our youth community at Adat Shalom — and it is fun! This year’s youth department calendar is filled with a fantastic variety of activities. For the full calendar and more information, contact Jodi Gross. Events such as Sunday afternoon Kids’ Afternoon of Fun (1st to 5th graders), Saturday Evening Kids’ Night Out (1st to 5th graders), Middle School Comedy Sports Night (6th-8th graders), Volunteer Day and other programs create opportunities for your kids to foster friendships that could last a lifetime. We have a variety of options for teens to get involved – whether they are looking for formal educational options or fun social events. In addition to the synagogue’s many offerings, which are available here, our congregation’s teens are involved in BBYO and/or USY, as well as many amazing Jewish teen programs throughout the community. A good number also attend Jewish summer camps throughout the region (and country).